These Halloween cookies are courtesy of our contributor Shayna…I can hardly believe that Halloween is right around the corner, sigh. But it is. Don’t get me wrong, I actually love Halloween. What I don’t like is that means winter is not far behind. Oh well. Let’s put winter aside and focus on the fun stuff! 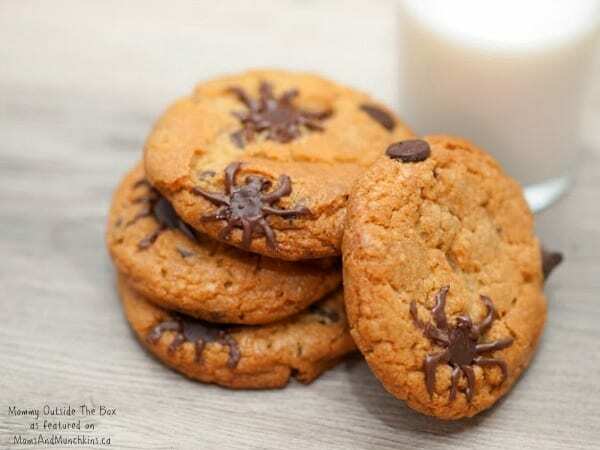 These spider infested chocolate chip cookies are a simple and fun treat to serve at a Halloween party, to take to the office to share, or just for a fun treat at home. This post was inspired by Beth’s creation over at Hungry Happenings. 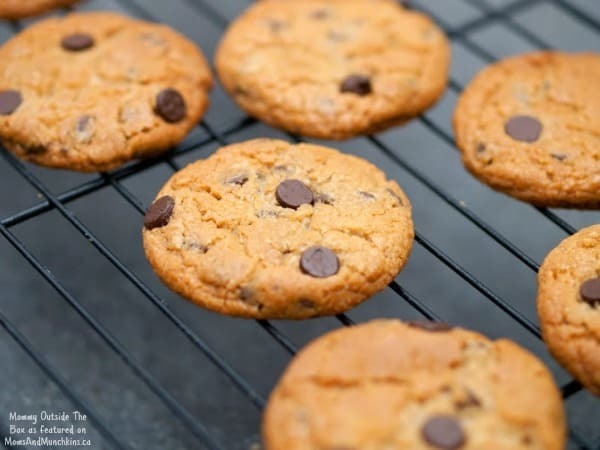 I have included my go to chocolate chip cookie recipe here but you can use your own favorite recipe as well. My recipe makes about 3 dozen cookies. Perfect as a Halloween treat! Mix butter, sugar, vanilla and water until creamy. Beat in eggs. Add flour, baking soda and salt. Stir in chocolate chips. Drop my rounded teaspoon onto a greased or lined baking sheet. 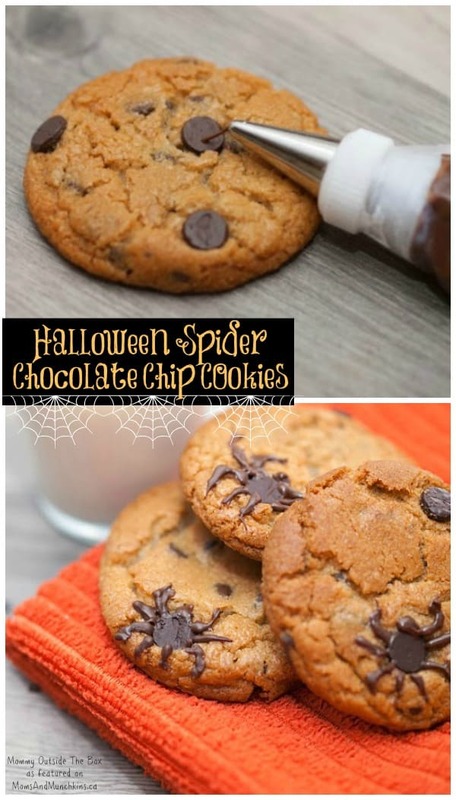 Make sure there are a few chocolate chips on the top of each cookie to make your spider after. You can just place a few on top if necessary. Bake for 10-12 minutes or until they start to brown. While the cookies are cooling place the extra chocolate chips in a small microwavable bowl. Heat for 30 seconds at a time, taking out and stirring each time, until they are melted and smooth. 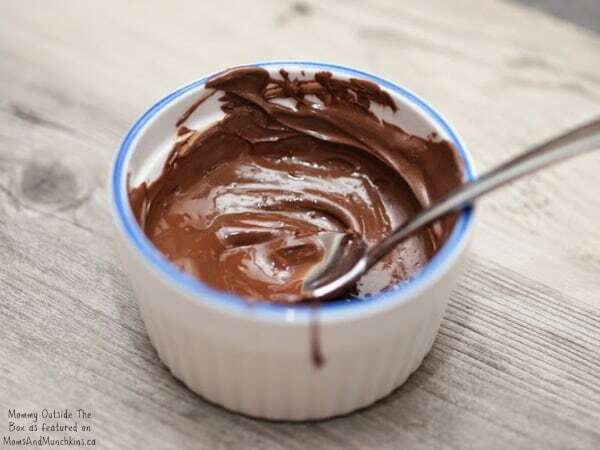 Place the melted chocolate in a piping bag with a small, plain tip. You can also use a small decorating squeeze bottle or even a sandwich bag with the corner cut out. Pipe a head and legs onto some of the chocolate chips. That’s it! Allow the chocolate to set completely before storing. Looking for more delicious ideas by Shayna? 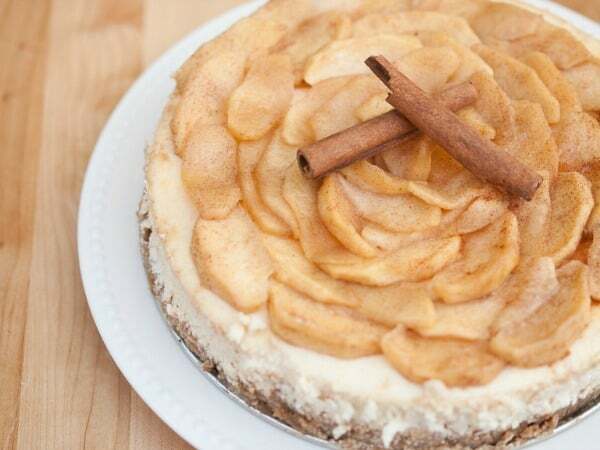 Check out this mouthwatering Spiced Apple Cheesecake that would look perfect on your table this Thanksgiving! 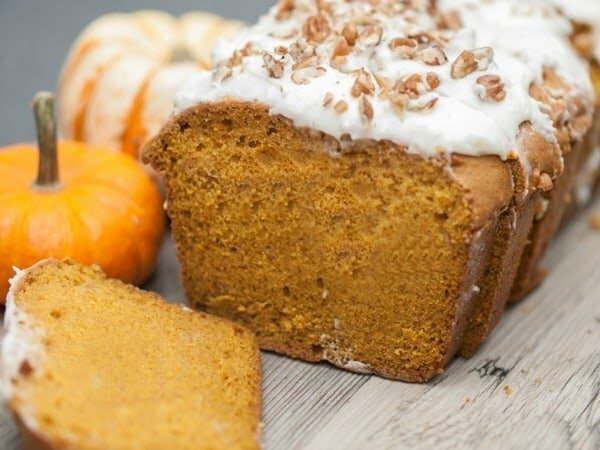 Another recipe that would be perfect for Fall entertaining is this Pumpkin Spice Loaf. Follow Mommy Outside The Box on Facebook, Twitter & Pinterest for even more delicious ideas. Hi there! I’m just stopping over from the Inspiration Monday link party. This is such a cute idea!! Pinned! Thank you, Meme! 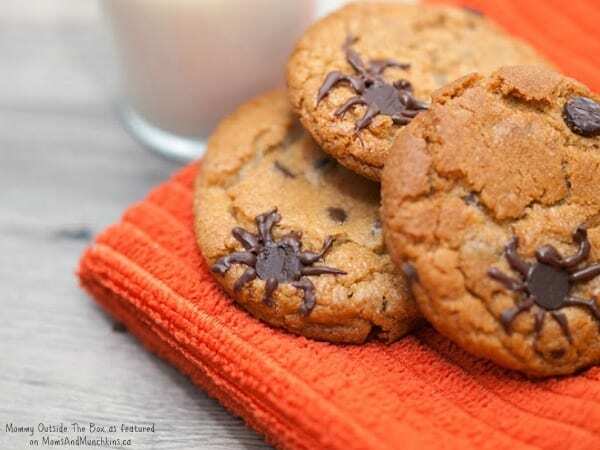 Who knew spiders could look so delicious, right?! This is a spooktacular idea! Pinning this! My apologies, this post was submitted by a contributor and a source of inspiration was not mentioned. I’ve added a link back to the Hungry Happenings post by Beth. to stay thick looking? Yours look so perfect! They are super tasty though! hello. I noticed someone else had the same problem and I don’t see that you replied. But I baked these today and mine too came out flat and looked nothing like yours. none of the crackles that I see in your picture. Yours look very professional bakery like. help? Hi Betty! I’ll ask the writer of this post, Shayna, to get back to you on this. Thanks! Hi Betty. Getting cookies to be the exact consistency you want can be a bit of trial and error. So many things can make a difference, the temperature of the butter, how you measure your dry ingredients, etc. There are a few things you can try to make your cookies less flat. 1. Add a bit more flour. I would then test bake 1 or 2 cookies and see if I added enough. 2. Chill the dough before cooking. 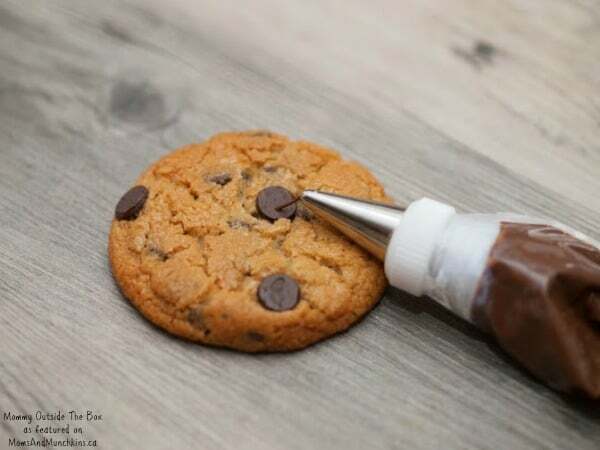 This will help keep the cookies from getting too flat. 3. Add 1 tsp of baking powder to the recipe (in addition to the baking soda) to give the cookies a bit more height. 4. Replace the white sugar with more brown sugar. Cookies with only brown sugar tend to spread a little less.